Dominus - The Dominus has a high-end PU top coating. The finely textured surface allows for optimal workings of your mouse: every small movement is perfectly translated onto your screen. Also the 115cm desk easily fits two monitors so you can game full screen and look up gaming strategies or keep an eye on your chats on the other screen. 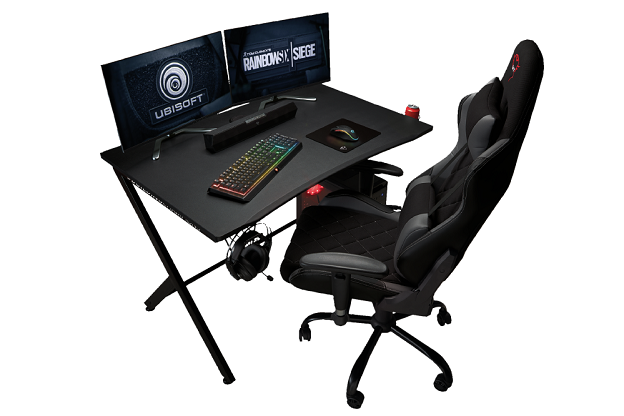 Resto - The Resto gaming chair comes with two removable and adjustable cushions to provide optimal comfort, allowing you to keep on top of your game for hours. The lumbar pillow provides your back with support and extra relief. The neck cushion features as a headrest and releases tension.